Article first published as The Best Paid Apple iPad Apps of 2010 on Blogcritics. 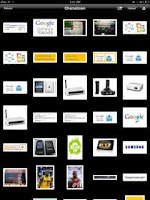 With 2010 coming to an end, it's best to reflect on the year in gadgets that was defined by the iPad . As discussed previously, the iPad was largely successful because of the "gold rush" that came with apps flooding the App Store as developers worked hard to be the next "must have app". Of course, unless you go the ad supported route, profits only come when there's income generated. So unlike those featured in our Best Free Apple iPad Apps roundup, here are ten apps I've used extensively throughout the year, but only after I shelled out anywhere from $0.99 to $29.99. What's worth your hard earned iTunes funds? See below for the best of 2010. 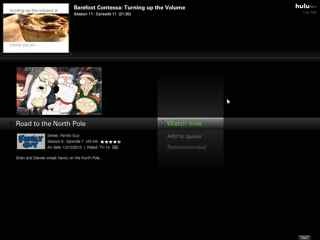 Web Albums ($1.99) - I don't connect my iPad to my computer enough. 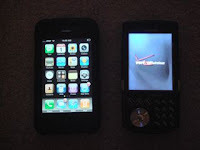 In fact, I try to stay in sync wirelessly as much as possible. Email, Calendar, and even documents are all managed in the cloud. However, for photos, I was stuck with a sync between iPhoto and the iPad. 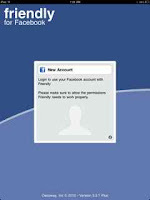 With Web Albums, users can connect to their Picasa account and view any photo stored in their folders. Once viewed once, photos are stored in the cache so even without a connection (crucial for my WiFi iPad), the app behaves just like the native Photos application. From Web Albums, you can also delete, email, and save the photo directly to your iPad. Yep, Hulu on my iPad! Splashtop ($0.99) - As a gadget addict (portable ones being my biggest downfall), I am always on the lookout for newer and cooler devices. Although I do most of my work online and in the cloud, I still rely on actual software at times, including several programs that are only PC compatible. I looked into other Tablet devices since the iPad can only do so much, but not surprisingly, the pickings were slim and often overpriced. 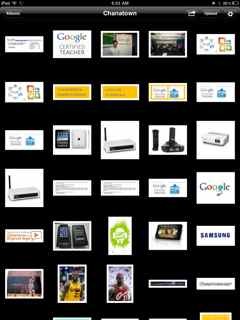 However, for a mere $0.99, I was able to control nearly any computer in my house directly from my iPad (port forwarding is available for outside your network). That also opens the door to any website (think: Hulu online) that can now run on the iPad's screen and includes sound as well. Setup is easy, navigation is smooth, and the overall experience is remarkable. There's even a free version if you just want to try it out (5 minute connection limit), though I can almost guarantee that you'll spend the dollar after you experience a full computer experience on your iPad. 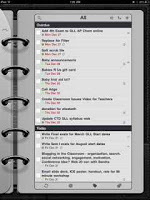 ToDo ($0.99 sale), 2Do ($6.99), Toodledo ($1.99 sale) - Honestly, I go back and forth and back again between these productivity apps. 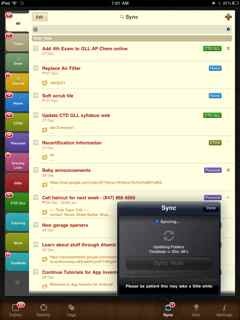 Currently, I use ToDo most frequently as it offers just enough functionality with a fast sync option with my online Toodledo account. I do appreciate 2Do's colorful interface and drag and drop interactions. The sync is reasonably fast as well, though a tad slower than ToDo. One would think that Toodledo should be the best bet for integration with its own online service, but the decent app loses out in terms of design and lackluster features. GoodReader ($2.99) - PDF's are made to be viewed only, right? Wrong. With GoodReader, not only can you view your PDF's in full iPad glory, but you can mark them up with annotations, notes, and even freehand sketches. Two of the best features included from the get-go were the seamless integration with Google Docs and Dropbox files and a stellar file management system. And perhaps best of all, the developers continue to improve their top seller with timely updates and new extras. 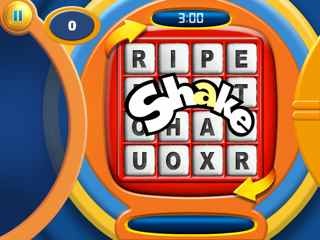 EA Games Sale ($0.99) - Question: What do Boggle, Yahtzee, and Scrabble all have in common? Answer: They are well polished games produced by Electronic Arts and all may be on sale for as little as $0.99. Even at full price, the games may just be worth the price. 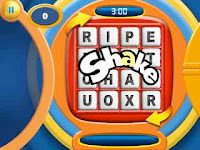 All use the touch screen on the iPad to the benefit of each classic's easy to learn game play. For more insights and additional games to choose from, check out the full article here. 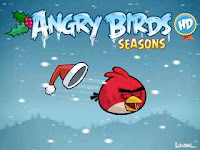 Angry Birds HD ($4.99), Angry Birds Seasons HD ($1.99) - I am a big fan of this addictive game on my Droid X (interestingly, Angry Birds is free on the Android Market). However, the game that has taken the world by storm unsurprisingly plays that much better on the big 9.7 inch screen. Unfortunately, you will have to plunk down $5 for the iPad version, though you can get started with a $2 holiday version. See for yourself why Angry Birds references are included in so many Facebook and Twitter updates, and why Conan featured it in a commercial. However, be careful, as you just might get addicted within seconds. 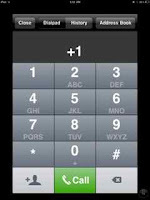 Talkatone (Free) and GV Connect ($2.99) - Recently, I decided that I wanted to use my iPad as a phone. It has a microphone (did you remember? ), so there has to be a way, right? I recall using Skype as an iPhone app awhile back, but I wondered whether there was an alternative that wouldn't require other users to have Skype or cost me any coinage. 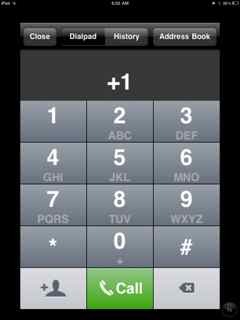 A little searching revealed Talkatone, a free app that uses the call function now available through Google Talk. Testing revealed some spotty calls, but overall, or in a pinch, it worked. For a complete Google Voice experience, you can pick up GV Connect which unlike the official Google Voice application, can connect with Talkatone to make phone calls directly from your iPad. SlingPlayer ($29.99) - Pricey? Yes. Worth it? Definitely. Possibly the best version of the mobile Slingbox applications, the iPad version delivers a high quality picture, and thus enables users to stream their television, cable, or DVR feed directly to the iPad. This came in handy as we are a one television household, yet I was still able to enjoy an exciting sports finish from the bedroom. Check out my full review from earlier in the year. 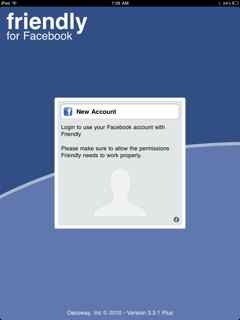 Friendly Plus - Facebook ($0.99) - Do note that there is a perfectly good free version of Friendly, but for a meager buck, it is probably worth it to lose the ads on the bottom, especially for those who use Facebook often. As long as Facebook delays on a native application of its own, third party developers will have a gold mine opportunity, and Friendly Plus kindly fills the void. Live feeds, Friends, Events, and Profile viewing are all possible in full screen glory on the iPad. There's even a quick Google browser built in for fast searching while friend surfing. What more do you need in life? 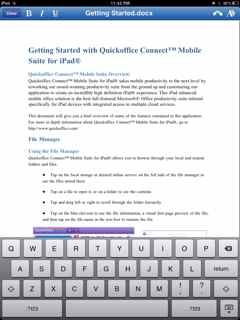 Quickoffice Connect Mobile Suite ($14.99 sale) - At work, I'm a PC guy, so that means I'm tied to MS Office, as I'm sure many of you are as well. So, as much as I want to download, install, and play around with the iWork suite on the iPad (Pages, Numbers, and Keynote), I needed a more Office friendly suite of tools. 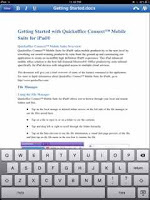 With Quickoffice, I get that for the price of less than two of the Apple apps. The program gives you the ability to not only view your docs, spreadsheets, and presentations, but also edit them (PowerPoint 2003 only at this time). Honestly, I don't envision doing much intensive editing or document creation on my iPad - I'm nearly always close to a laptop - but for those who do want a truly portable solution, or the ability to work during a meeting on their iPad, this app does the trick. The clincher? 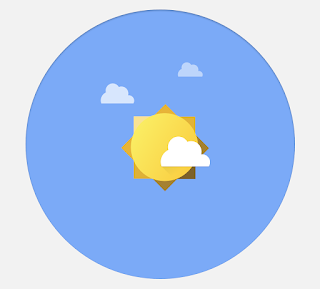 Seamless integration with Google Docs and Dropbox files make this a definitely cloud friendly application. 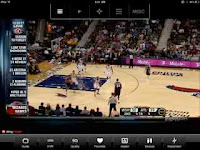 Don't forget to check out the Best Free Apple iPad Apps of 2010. Thanks for reading - I'll see you in 2011.